Losing a tooth may not seem like much of a problem until it happens. For instance, you’re simply chewing gum or popcorn and crack! Your tooth cracks and crumbles. Now what? It’s hard to chew and you are in pain. You go to the dentist and they tell you that your tooth is beyond repair. If you get it pulled it is still going to be hard to eat and feel weird. Depending on where the tooth is located it may look bad, too. The easiest option is to replace it with a bridge. So…to bridge or not to bridge…that is the question. There are two types of bridges: removable and fixed. 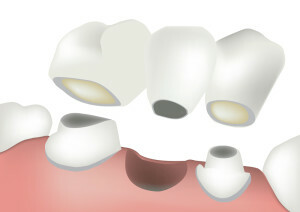 Removable bridge: The removable dental bridge consists of a false tooth (pontic) with metal frame-work on each end. This metal frame-work hooks over the teeth adjacent to the gap left by the missing tooth and the pontic, or false tooth, fills in the gap. Fixed bridge: A fixed bridge consists of a prosthetic tooth in the middle and a crown on each end (referred to as abutment teeth). The procedure to place a fixed bridge includes grinding down the healthy teeth adjacent to the gap left by the missing tooth, taking impressions of the area, and sending the impressions to a lab where they fabricate the bridge and two abutment teeth. Your dentist then permanently bonds the crowns onto the prepared teeth. Another option is the dental implant. If you are not interested in a bridge, but you do not want to live with the discomfort and stigma of a missing tooth, a dental implant is a permanent fix. Implants, however, require a complex surgical procedure and a healthy jaw bone. If you are interested in a dental implant, Dr. Huffstutler will be glad to assess whether or not you are a candidate for an implant procedure.